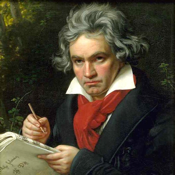 Ludwig van Beethoven（1770.12.16—1827.03.26）was a German composer and pianist. A crucial figure in the transition between the Classical and Romantic eras in Western art music, he remains one of the most famous and influential of all composers. Beethoven is acknowledged as one of the giants of classical music; occasionally he is referred to as one of the "three Bs" (along with Bach and Brahms) who epitomise that tradition. He was also a pivotal figure in the transition from the 18th century musical classicism to 19th century romanticism, and his influence on subsequent generations of composers was profound. Op.135.4 in F major - Muss es sein? Es muss sein!